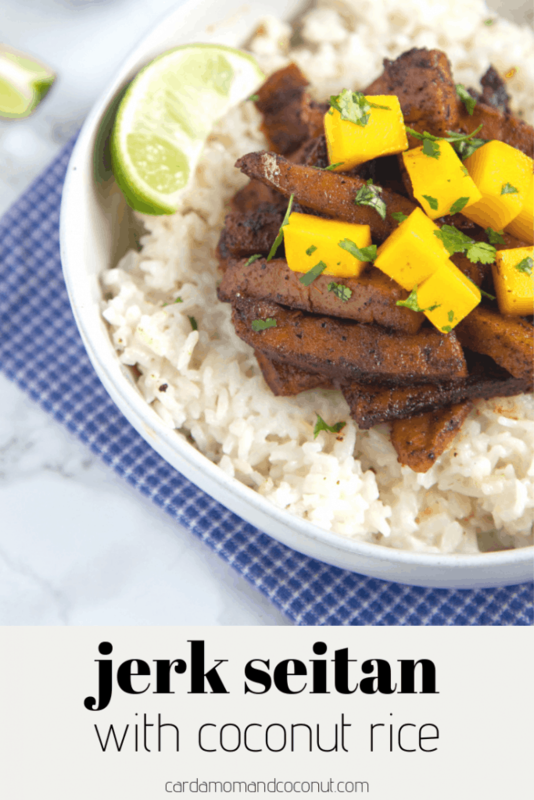 An easy vegan dinner recipe featuring strips of seitan in a spicy jerk sauce with rich, creamy coconut rice. I recently went on a trip to New Orleans. All of the food I ate there was incredible, but one of the spice combinations I saw again and again was jerk seasoning. I wanted to figure out a way to bring back this flavoring into a healthy vegan dish I could make at home. The result is this Jerk Seitan with Coconut Rice. 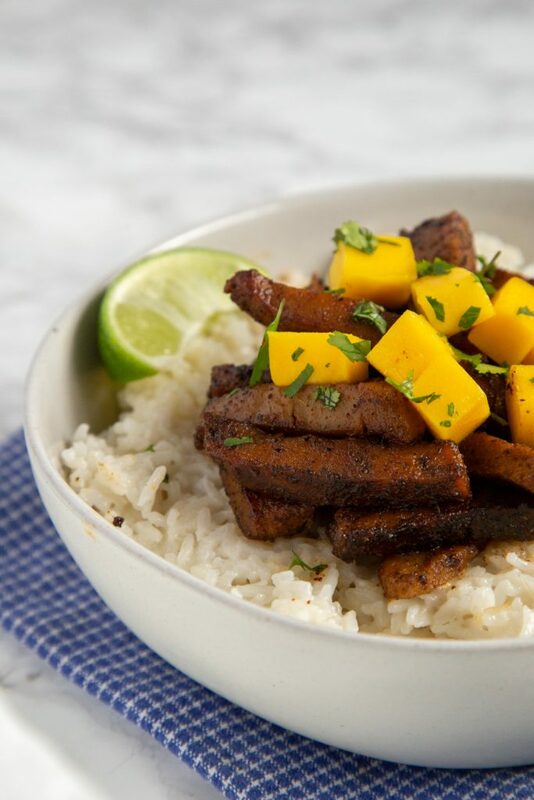 The creamy coconut rice perfectly complements the spicy jerk seitan. Start with the coconut rice. Mix the rice, coconut milk, and water together in a rice cooker and cook. Or you can mix all the ingredients together in a saucepan and cook on the stove following the directions on your package of rice. While the rice is cooking, work on the seitan. We’ll start by blooming the jerk seasoning. Blooming spices, or frying them in oil, is a great way to deepen their flavor. Add two tablespoons of vegetable oil to a medium nonstick skillet. Then add the jerk seasoning and cook for about 4 minutes, stirring constantly. Then pour the seasoning mixture into another bowl and place the skillet back on the heat. Add the remaining tablespoon of vegetable oil and cook the seitan for about 4 to 5 minutes until heated through. Remove the skillet from the heat and add the jerk seasoning mixture to the seitan. Mix together until the jerk seasoning is coating the seitan. Serve with the coconut rice. Looking for more easy vegan recipes? 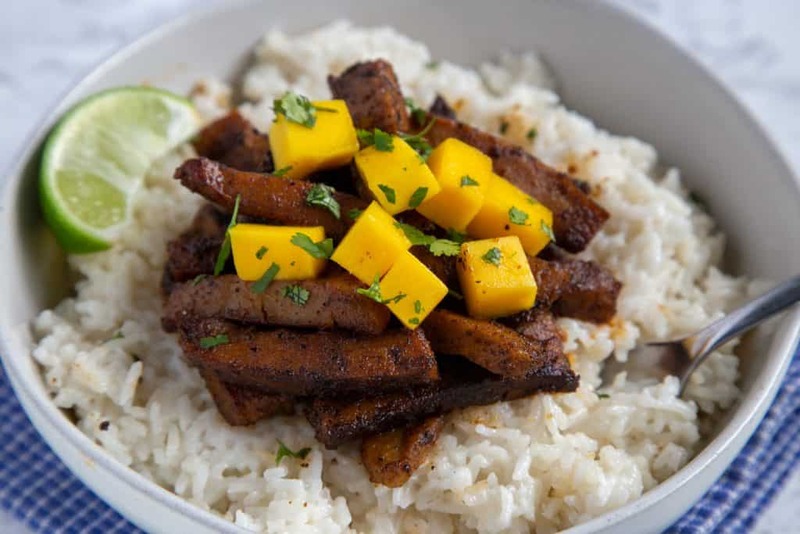 Try this Curry Seitan with Pineapple Rice, Peanut Sauce Tofu, or Ginger Scallion Noodles. 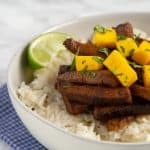 If you try this recipe for Jerk Seitan with Coconut Rice, leave me a comment and a review below and let me know how you liked it. To make the rice, mix the rice, coconut milk, and water in a rice cooker and cook until done. Alternatively, cook the mixture on the stove following the timing on the rice package. While the rice is cooking, heat a medium nonstick skillet over medium heat. Add two tablespoons vegetable oil and then the jerk seasoning. Cook for about 4 minutes, stirring constantly, until the jerk seasoning is fragrant. Then remove the skillet from the heat and pour the sauce into a bowl. Place the skillet back on the heat. Add the remaining tablespoon of vegetable oil. Then add the seitan and cook for about 4 to 5 minutes until heated through. Remove from the heat and pour the jerk sauce over the seitan. Mix through until the seitan is coated by the sauce. Serve with the coconut rice.